There has been quite an uproar in Zimbabwe since the announcement by the Reserve Bank that their authority would begin to issue instruments of payments called “bond coins” from early December in an effort to satisfy the demand for small change. You know when your endeavors are well & truly unsuccessful in trying to re-circulate a type of national coin when even a beggar in the street says “no thanks” to said coins when offered! Well, that’s just what apparently happened recently in Harare, the capital of Zimbabwe, when a journalist tried to off-load a handful of the newly minted but apparently worthless coins to a panhandler. The story all began when the beleaguered economy adopted the US Dollar as legal tender in 2008 as their own Dollar collapsed under inflationary conditions which were said to have reached levels of 500 billion percent – well before the country’s central Bank no longer bothered to keep count. Since then, several currencies have taken root in the Southern African country, single-handedly ruled by the corrupt and dictatorial president, Robert Mugabe, in power since the country attained independence in 1980. Aside from the US Dollar, the South African Rand, the Euro, the Botswanan Pula, even the Japanese yen have all been circulating freely. However, there can be some complications when one country adopts another country’s currency, and that’s the problem of what to do when there is a shortage of coins to meet the demand of commerce and cash transactions – as Zimbabwe was facing. An agreement by the Reserve Bank with the Federal Reserve to import sufficient coins last year fell through due to restrictions and sanctions against the Mugabe regime so, a solution had to be found. The practice of giving out small priced candies, cigarettes, pens and other trinkets as change for purchases not rounded up or down to the nearest dollar was in place but, in Zimbabwe, even 10 or 20 cents can reflect a lot of money to someone earning less than five dollars a day. The solution was for the Reserve Bank’s president to introduce and unveil the “bond coin”, a scheme which included a bond floated to guarantee the value of these coins, the value of which was disclosed to be worth 50 Million US Dollars. The coins, without actual country name, rather just with subtle initials of RBZ in the background of the prominently placed year date – are produced by the South African Mint were announced to have values of 1, 5, 10, 25 and 50 cents with the 50 cent coin being introduced into circulation in the middle part of 2015. To date, the overall populace of Zimbabweans have shunned these coins since their official release into circulation last month. With fears that the government is seeking to “introduce” the Zimbabwean Dollar into the economy by way of these coins, the acceptance of these coins has been anything but a success. So reluctant are Zimbabweans willing to accept these coins that when a journalist from Reuters recently attempted to give a handful of these coins to a traffic stop beggar, he actually refused them with laughter heard from passers-by and a reply of “no thanks” from the beggar himself who moved onto the next car hoping for a better outcome. The Reserve Bank Governor Mangudya confirmed to the state-owned Herald newspaper last week that only 2 million 500 thousand Dollars’ worth of the Bond coins were in currently in circulation out of the 10 million Dollars that had so far been imported. He cited the low circulation of the coins was due to commercial banks not placing larger orders from the central bank for the coins. The suggestion made by this author last month before their introduction that the only value the new Bond coins would have to Zimbabweans would be on auction sites and sold in sets to interested collectors. I’m pleased to say that at least one prospective entrepreneur has taken up the task and placed several sets up for sale on a leading online auction site. Those of us who write about coins on a regular basis always like to emphasize that ALL coins have some value – and in in the case of the new Bond coins, the secondary market may well & truly make that point! Who really want these so-called coins? 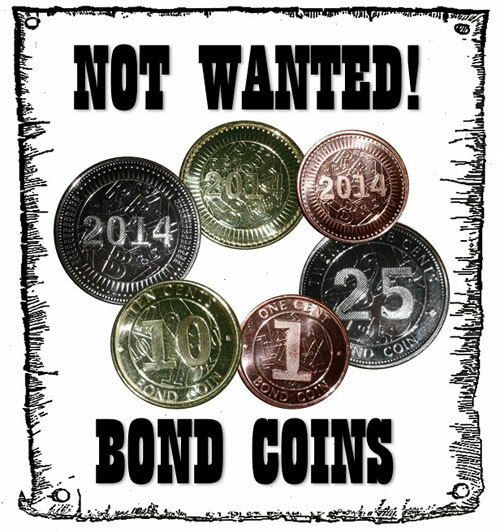 Since these junk-bond coins that no one in that country want to use it, where these coins will ever end up? Maybe they should try Monopoly money. This is a clear warning sign as to how economic mismanagement can have disasters us results. Good article, Michael. As I mentioned in my article, it may indeed be the Reserve Bank testing the waters to determine if a new ZIM dollar is feasible which would of course open the door to this particular regime to literally “print” as much money as it sees fit to rob the people of their resources and hard currency savings. The Zimbabwean public have so far made it very clear that they are not ready for the return to their old Dollar which had been so terribly misused and poorly goverened by Mugabe and his cronies that this country which should be one of the more prosperous on the African continent, almost starved itself out of existence. Once again, proof that the so called private banks are part and parcel the central bank. It is these private banks which rob the sheeple of their rightful autonomy. This same tactic is being done in ussa, where supposedly no one wants usd dollar coins, so they are hoarded by the banks and kept from circulation. I surmise the russian central bank also does the same thing, intetnionally crushing the russian economy by raising rates to an absurd 16%, which will do nothing since foreign onvestors are intentionally boycotting russia and taking their currency with them. I hope one day we may all come to see the light that the private banks are not for the common man. Well, there are plenty of topics to cover in your comment – yes, Central Banks can indeed be the very problem which is at the crux of the matter and in the case of the Reserve Bank, this can be said without hesitation. In the case of commercial banks – I would imagine that in the case of these bond coins, my thought is that had the commercial banks issued their own version of commerce coins to meet the demand of small change in the zimbabwean economy, we would not be having this conversation as I suspect there would be little or no question as to their validity or worth. In the case of the American dollar coin, it has been widely accepted that the American public are simply used to and prefer the dollar note as opposed to the coin and if the note were removed from circulation, the US would make the transition to a dollar coin much the same way other countries have transitioned from paper denominations to coin but… this is a decision of the House & Senate and as we all know, this kind of debate could go on forever. It is why I have said repeatedly that decisions of coin and banknotes should be in the hands of the US Mint, the US Treasury, the Bureau of Engraving & Printing and the Federal Reserve in the form of a small committee rather than with Congress andthe many members who have agendas all their own or are heavily lobbied by special interest groups. Russia’s economy are hampered both by western sanctions deservedly in place over their actions in Crimea as well as their heavy dependence on ostensibly one commodity, oil – and as it loses greater ground price-wise, so goes their proposed budget and expenditure. The fact that many Russians are also hedging their bets by removing their money, in the form of US dollarsand euro or any other hard currency they can get their hands on, this is why the Central Bank raised their interest rate to an unmanagable 16% which of course only ends up hurting ordinary Russians who must now try to manage mortgages and loans given to them denominated in Dollars and with the plunging value of the ruble, it becomes even more unsustainable.